Award-winning Argentine artist creates playful artwork to celebrate the Youth Olympic Games, which kick off in Buenos Aires this weekend. Tomorrow morning, at 8.45am, we all are invited to see, witness and participate in a giant ball parade, as envisioned by the world renowned Argentine artist Leandro Erlich. 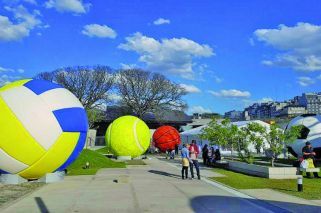 A procession of balls – featuring a giant football, tennis ball, basketball, golf ball and volleyball – will depart from the new exhibition and convention centre at Avenida Presidente Figueroa Alcorta and head toward the Planetarium, Buenos Aires’ own iconic ball and viewpoint to the universe. 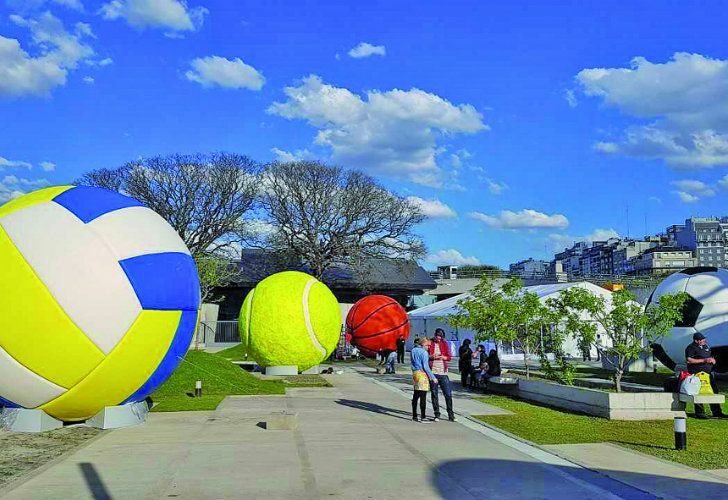 Ball Game, the artwork created by Erlich in conjunction with the Youth Olympic Games, which begins this weekend in Buenos Aires, will remain there until October 18, the event’s final day. Every hour, the balls will be moved by members of the public in a unique, playful ball game, one which only works through collective participation. Asked whether he has a more direct connection to sports, Erlich recounts a time when he used to be an athlete. He shows a scar on his arm, caused by an old athletic injury. In 2014 the Olympic Foundation set up an international programme through which artists are commissioned each year to make a work in which they, through their art, present a different perspective on the Olympic Games and their philosophy. This idea, of bringing people in public spaces together, is what brought the foundation’s officials to Erlich, an artist wellknown for his interactive installation pieces, such as Bâtiment or The Swimming Pool. In these works, he created ludique illusions, surprising his audiences, who are invited to form part of the artworks, by seeming to make them hang from the side of a building or stand at the bottom of a pool. Erlich’s playful approach is often very photogenic. It’s also not that difficult to understand, as in this current work that brings together five giant balls, illustrating five sports from the Olympics. When quizzed about it, he agrees that it seems like a simple proposal. Once you have pushed a giant golf ball through the streets of Buenos Aires, together with a group people you don’t know, you may be able to let go of the economic problems haunting you and the country as a whole. Moving forward through togetherness is the artist’s hope. Perhaps, as antiquity taught us, social participation and games really does go hand-in-hand with the bread, aside from providing us the beauty of an Olympic feast.